Made in Japan, these chopsticks with case features several dragonflies flying in an abstract night sky. With a smooth and glossy glaze on both the chopsticks and case, these chopsticks with case are made out of wood while the case is made of plastic. 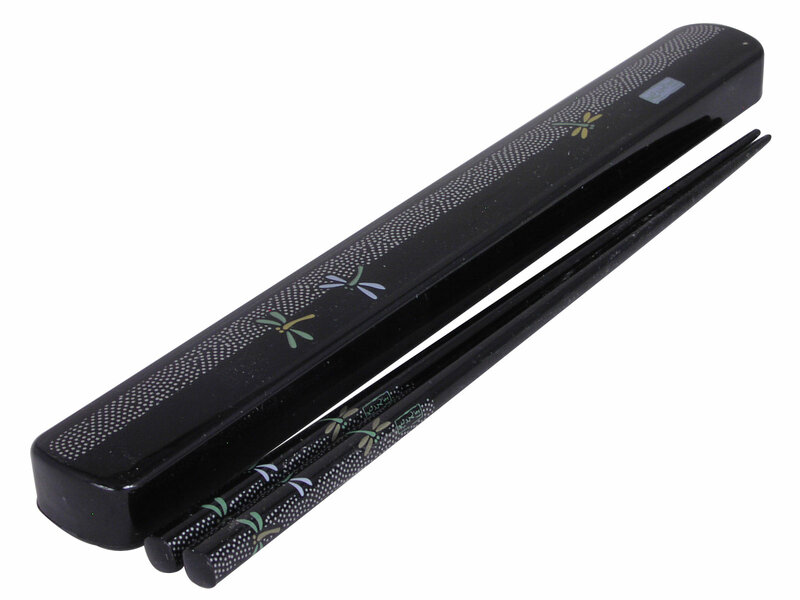 The travel chopsticks are mostly a lacquered black where the top of the chopsticks features the abstract dotted white stars with green and yellow dragonflies flying around. The bottom tapered tip of the chopsticks also has a grainy textured feel, which makes it easier to hold onto slippery foods like noodles. The plastic case also features this same abstract star and dragonfly design on the top of the case as well as a small stamp form the artist. With a piece that you can slide out from the case to put the chopsticks in, this chopsticks with case is perfect for enjoying your lunch or meals at restaurants as they can be easily taken with you anywhere. 2 of my favorite things in one motif design. I plan to use these when I eat meals at home. Easy to clean with convenient carrying case. Had bought something similar to this from a Korean gift shop. The gift shop is never open when I�€™m available so I decided to purchase online.